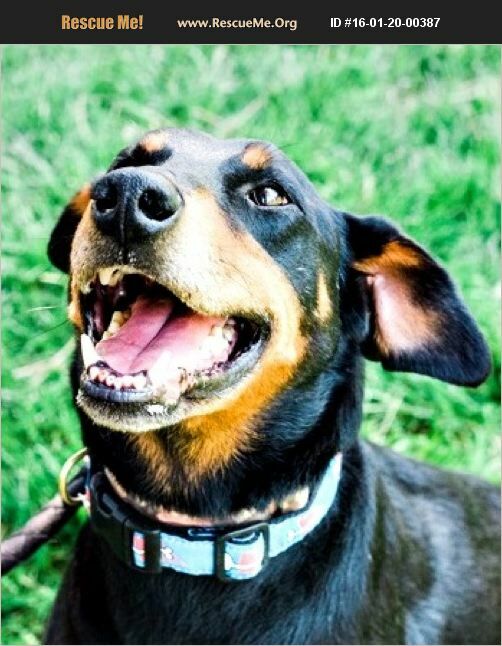 Hook, line and sinker��%BD'��%BD|Alvin the adorable 7-9 year old Doberman mix will melt your heart. He is devoted to people and will greet you with love and enthusiasm, and maybe even ask for belly rubs. This sweet boy is estimated to be between six to seven years old, so he comes with experience. Alvin had a family of his own, but they didn't have time to spend with him to help him build confidence while they were away. He has some Houdini-skills so until he overcomes separation from people a specialty crate is needed to give him security and guidance. We have found that he is fun and athletic, so active families who likes to hike, run and camp would find the perfect co-pilot for Colorado adventures! This guy is a love bug who bonds tightly to his people and has some good watch dog abilities. A home with another dog similar in age and adolescent children would be the best fit. Sorry sweet felines, no cats need apply, Alvin is happier with other canines. He has the authentic Doberman characteristic of wanting to be right next to you, so his stick-to-ness is a loving gesture that only Dobie savvy owners may truly understand. If you are looking for a completely dedicated guy to add to your home look no further! Alvin is up to the task and will give unconditional love to you and your family. All animals adopted from us are fully vetted including spay/neuter, vaccines, microchip, heartworm test and deworming. Please email us at HookedOnDobies@gmail.com, visit our Facebook page www.facebook.com/savingdobermankind or webpage https://www.savingdobermankind.org to request an application, inquire about an adoption fee, or to learn more! We do require a completed adoption application to be submitted before discussing details of a specific Doberman. We DO NOT have a central location, out foster homes are located throughout our geographic region including CO, WY, NM and TX. We strive to PROTECT the privacy of out fosters. ALL Doberman meet and greets are conducted in a neutral meeting location made by appointment only.